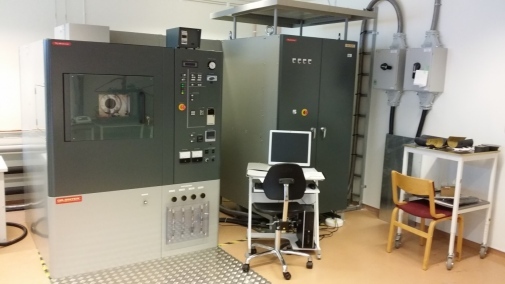 The national spark plasma sintering (SPS) facility has been established at Department of Materials and Environmental Chemistry at Stockholm University. 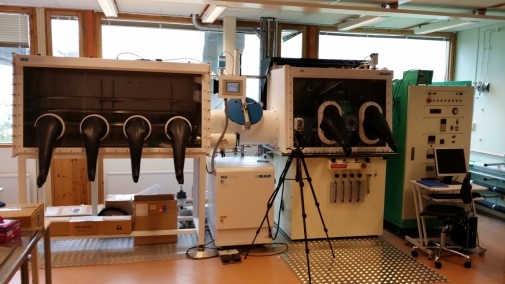 The facility has two SPS machines SPS825 and SPS530ET integrated with glove-box. The SPS machines were supported by infrastructure-grant for expensive scientific instruments from Vetenskapsrådet. The SPS facility is capable to subject the materials to rapid sintering cycles in vacuum or inert atmosphere. The materials include but are not restricted to ceramics, metals and alloys, intermetallics, composites and porous materials. The SPS facility can produce sintered materials of both small and large dimensions and handle air-sensitive materials. SPS 825 is suitable for heating medium and large size samples in vacuum and inert atmosphere. The integrated pressing unit provide a pressing force that covers the range from 2-250kN. SPS 825 can heat dies containing powder materials at a heating rate from 1 °C to 1000 °C per minute and upto 2500 °C. SPS 825 is equipped with ultra-high vacuum system. SPS 530ET is suitable for heating small and medium size samples in vacuum and inert atmosphere. The integrated pressing unit provide a pressing force that covers the range from 1-50kN. SPS 530ET can heat dies containing powder materials at a heating rate from 1 °C to 1000 °C per minute and upto 2500 °C. SPS 530ET is integrated with a glove-box, suitable to prepare, prepack and prepress air and water sensitive materials. SPS 530ET is equipped with ultra-high vacuum system.